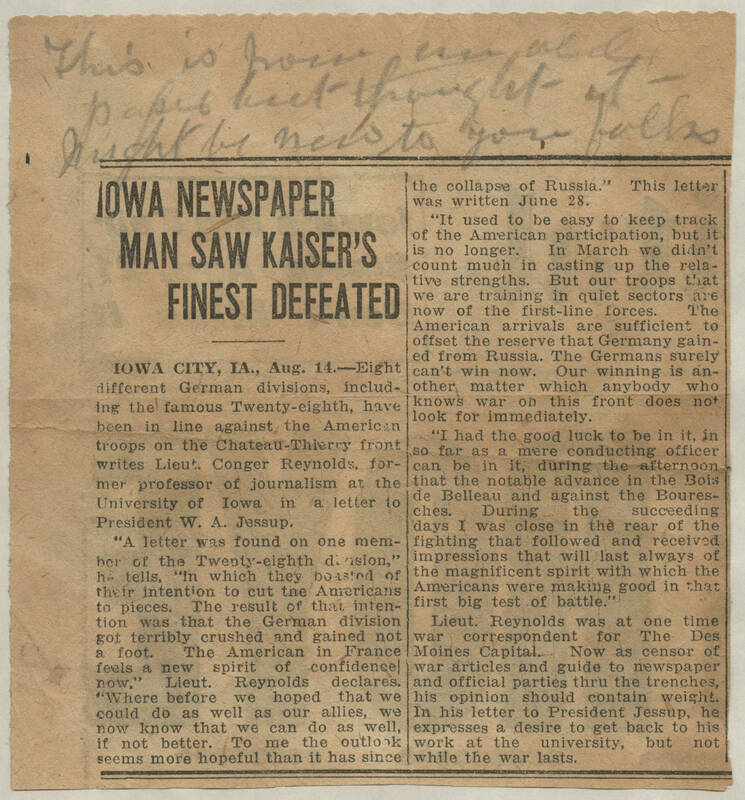 DIY History | Transcribe | World War I Diaries and Letters | Conger Reynolds newspaper clippings, 1916-1919 | 1918-08-14 Clipping: ""Iowa Newspaper Man Saw Kaiser's Finest Defeated""
1918-08-14 Clipping: ""Iowa Newspaper Man Saw Kaiser's Finest Defeated""
[handwritten on top] This is from an old paper but thought it might be new to you folks Iowa Newspaper Man Saw Kaiser's Finest Defeated Iowa City, IA., Aug. 14. -- Eight different German divisions, including the famous Twenty-eighth, have been in line against the American troops on the Chateau-Thierry front writes Lieut. Conger Reynolds, former professor of journalism at the University of Iowa in a letter to President W. A. Jessup. "A letter was found on one member of the Twenty-eighth division," he tells, "in which they boasted of their intention to cut the Americans to pieces. The result of that intention was that the German division got terribly crushed and gained not a foot. The American in France feels a new spirit of confidence now," Lieut. Reynolds declares. "Where before we hoped that we could do as well as our allies, we now know that we can do as well, if not better. To me the outlook seems more hopeful than it has since the collapse of Russia." This letter was written June 28. "It used to be easy to keep track of the American participation, but it is no longer. In March we didn't count much in casting up the relative strengths. But our troops that we are now training in quiet sectors are now of the first-line forces. The American arrivals are sufficient to offset the reserve that Germany gained from Russia. The Germans surely can't win now. Our winning is another matter which anybody who knows war on this front does not look for immediately. "I had the good luck to be in it, in so far as a mere conducting officer can be in it, during the afternoon that the notable advance in the Bois de Belleau and against the Bouresches. During the succeeding days I was close in the rear of the fighting that followed and received impressions that will last always of the magnificent spirit with which the Americans were making good in that first big test of battle." Lieut. Reynolds was at one time war correspondent for The Des Moines Capital. Now as censor of war articles and guide to newspaper and official parties through the trenches, his opinion should contain weight. In his letter to President Jessup, he expresses a desire to get back to his work at the university, but not while the war lasts.